Transformers: The Last Knight is an upcoming 2017 American science fiction action film based on the Transformers toy line. It is the fifth installment of the live-action Transformers film series and a direct sequel to 2014's Transformers: Age of Extinction. The film is directed by Michael Bay, with Mark Wahlberg and Stanley Tucci reprising their roles from Age of Extinction, alongside Josh Duhamel, Tyrese Gibson, and John Turturro from the first three films. 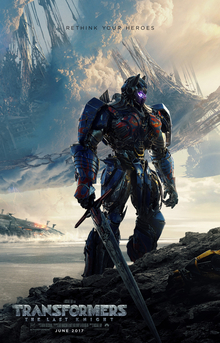 This will be the fifth and final Transformers film to be directed by Bay. In a battle for survival between the Human race and the Transformers, Cade Yeager forms an unlikely alliance consisting of himself, Bumblebee, an English Lord & a Professor from Oxford to learn about the reasons the Transformers comes back to Earth, without Optimus Prime.